See Odds ‘N Ends under the category Huh??? on the sidebar. For an explanation of methodology, see the category Indicators. The buy/short process should be completed on or before the initial breakaway from the bottom/top. Frequently the buy/short process will take place before the breakaway with a protective stop in place. STOPS protect a position from further loss when the market turns against us. I normally place STOPS below the low (above the high for a short). The later a transaction takes place after the breakaway subjects one to a greater loss if misinterpretation of the trend has taken place. The buy/short process should be completed on or before the initial breakaway from the bottom/top. Frequently the buy/short process should take place before the breakaway with a protective stop in place. Stops protect a position from further loss when the position turns bad. Later transactions subject one to a greater loss if misinterpretation of the trend has taken place. Confirmation Needed, Needs Confirmation, Unconfirmed – More market action is needed to confirm this viewpoint, until then it is only a supposition! Suppositions are theory and can go either way, right or wrong. For an explanation of my methodology, click “Indicators” under “Categories” on the sidebar. The stock market is always a choice between scenarios. Absolutes are seldom encountered. These notes were added to the category titled “Odds ‘N Ends”. Look around on the sidebar if you haven’t already. There are some great quotes from the oracles. I consider all purchases speculative if they don’t occur on a VERY significant bottom. Although the term speculative may too conservative for some inflection points, it will nevertheless remain my terminology. Speculative positions can turn into long term holding when the market goes our way. It is the exact opposite of the quote on the sidebar that says, “A buy and hold strategy is a short term trade that went wrong.”. Observations of Stock Market Trends is published each weekend. A daily update is likely near a stock market inflection point. If more than two weeks goes by without a comment, I’m dead and there will be no more comments. Without a daily update you are to assume that my last observation is still in force. Concerning last week, I was watching for a bottom. When it was obvious that a breakaway to the upside was under way, you should have understood that a bottom had occurred and the market was a buy. If you didn’t see this I will try to make myself understood in the future. With this new format I hope everyone will understand my message. I have created a detailed synopsis at the top of the page and I think those who are confused (or don’t understand my methodology) should read no further. If you want an understanding of what’s going on inside my mind as it pertains to the stock market, read on. I write about possible scenarios and don’t give advice (under penalty of death from the SEC). I can legally tell you what I’m doing personally and that’s exactly what this blog is all about, seeing into my ideas, scenarios and best possible moves. I have a very nasty habit of seeing things differently immediately before a turn (1 or 2 days) and occasionally after the turn. You may find this confusing but I call it the “aha” or eureka moment. Prior to this moment I may be trying to tell the stock market what to do rather than the stock market telling me what to do. If I have changed the wording from a previous update, the word “NEW” will appear next to SHORT, INTERMEDIATE or LONG TERM. On Monday June 27, 2011 the market began the breakout surge with a 58 point DJ Industrials gain, followed on Tuesday by a 138 point gain. For the week the DJ Industrials gained 5.4%. Friday was a 90% up day and that’s good news. If we can put several 90% days together over the next couple of weeks that would have very bullish implications. But first the market needs to carry through on today’s 90% up day. It would not be unusual to consolidate for a short period after today and that is especially true since the DJ Industrials are entering an area of congestion. It would be reasonable if later next week the market surges again. Is a head and shoulders formation unfolding??? It’s possible and I used to think it was likely but now I’m beginning to doubt it. Everyone is talking about a head and shoulders and that makes me uncomfortable accepting a growing majority viewpoint. If a head and shoulders is in play here, we are presently in the area of the left shoulder. If the rally continues and we achieve token new highs that should hush any talk of a head and shoulders. At the rate we are going new highs could be soon. A bottom occurred on June 15 (duhhhhhhh . . . . do you think). We are now in a rally phase that should return to the May 2nd peak. I would expect resistance at the old high with a consolidation. After that we will see if the market has the power to punch through for significant new highs. The shorter the period of consolidation near the May 2nd peak, the stronger the market and the higher we will go. The market is in a false rally and the market will turn down soon. This rally has crushed the downtrend since May 2, 2011 (below). A possible trend line for the current rally (below). Further rally early next week would require a rework of the trend line. The rally that began in early July 2010 is long in the tooth and showing its age (12 months). The market internals have been losing momentum and show that the market has been in a lengthy “topping” phase. This mode can continue for months. The decline since May 2nd is the first step down in a larger 3 step decline. If true, this would call for a lengthy decline lasting many months. If the market fails to make new highs on this rally and resumes the decline, it could mark the right shoulder of a head and shoulders formation. This is a very bearish event and if true, the June 15th bottom would be the half-way point to the bottom. The head and shoulders event will be nullified by a new high in the averages. Beginning in March 2009, large step one up topped in May 2010 and was followed by the “flash crash”, large step two up may still be in force. Since March 2009, most of the market indexes show two large rallies have occurred (March 2009 to April 2010 and July 2010 to the present). A couple of indexes show the possibility that we are in the third large step rally since 2009. The favored count at this time is that we are in large step 2 up since March 2009. The long step up since July 2010 has not finished and higher highs are in the not too distant future. We have begun the correction following the second large step up . We have resumed the bear market. What’s wrong with this rally. Semiconductors have the same position that steel and autos had in the 1950s. I see two large steps down since February. Where’s the third??? This group can have a very long lead time. If we achieve significant new highs the two steps down in this graph will be meaningless. (below). We have entered a very wide swinging market similar to that of 1966 to 1974. During that era we had three bear markets with two intervening bull market rallies. Each bear market had a lower low than the prior bear. The intervening bull market rallies saw new all time highs before the next bear market began. Since 2000 we have had two bear markets, 2000 to 2003 and 2007 to 2009. Like 1966 to 1974, the recovery from the first bear market saw a new all time high (2007 peak). It is possible that we may experience another all time high during the present recovery period. A new all time high following the March 2009 bottom is not necessary for this formation to continue. At the conclusion of the present recovery we will have the third and final bear market. An estimated time for the conclusion of the final bear market is approximately 2018. At the top of this update I have “Wide Ranging Megaphone Formation“. Below is a chart of the current megaphone formation in the DJ Industrials. You can see the widening formation with higher highs and lower lows. This is identical to 1966 to 1974 except we are traveling at a slower pace. I would expect the megaphone to be completed in 2018 with contact on the lower line. Contact would be approximately 5480 (DJ Industrials). If we also contact the upper line before turning down in the last bear market, the peak could be somewhere in the area of 16,600 (DJ Industrials) in 2013. A decline to 5480 would represent a loss of 67%. That is not an outrageous figure considering it is a Fibonacci number and represents a reasonable bear market correction for an individual stock. This would complete the 3 steps down from the multi-generational peak of euphoria achieved in 2000. On the third bottom in 2018 the mood will be one of total despair. No one will want to own equities in 2018, a mood similar to 1974 only much worse. Of course this might be a theoretical exercise should we never get the third leg down in the megaphone formation. That is certainly possible but considering the future of the US governments financial situation, it can’t be discounted. 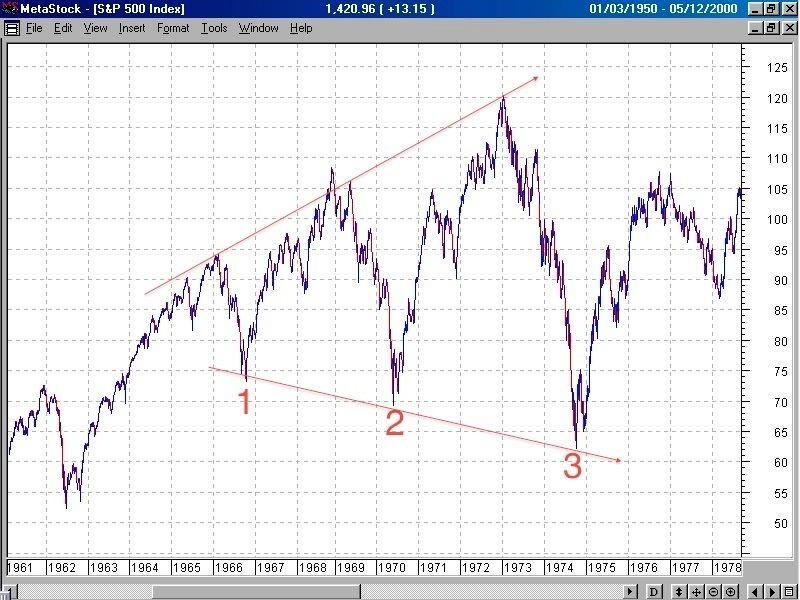 SP 500 from 1981 to the present, megaphone formation. SP 500 from 1966 to 1974, megaphone formation. This entry was posted on July 2, 2011 at 11:55 AM and is filed under IN DEPTH. You can subscribe via RSS 2.0 feed to this post's comments. You can comment below, or link to this permanent URL from your own site.